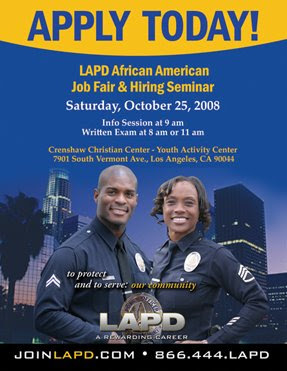 L.A., etc...: LAPD Job Fair! Two friends of mine recently expressed an interest in becoming part of the LAPD team, and they are now hiring. I definitely need more protection during these tough economic times, so I'm all for it. *cheese* Click the title link for more info...there's a job fair this Saturday, October 25, 2008 @ Crenshaw Christian Center. Dont think this will change anything. Crooked cops...carry on.